We live these days in a virtual nation of cities and celebrities, dreaming a small-town America rendered ever stranger by purveyors of nostalgia and dark visionaries from Sherwood Anderson to David Lynch. And yet it is the small town, that world of local character and neighborhood lore, that dreamed the America we know today—and the small-town boy, like those whose stories this book tells, who made it real. In these life-stories, beginning in 1890 with frontier historian Frederick Jackson Turner and moving up to the present with global shopkeeper Sam Walton, a history of middle America unfolds, as entrepreneurs and teachers like Henry Ford, George Washington Carver, and Walt Disney; artists and entertainers like Thomas Hart Benton, Grant Wood, Carl Sandburg, and Johnny Carson; political figures like William McKinley, William Jennings Bryan, and Ronald Reagan; and athletes like Bob Feller and John Wooden by turns engender and illustrate the extraordinary cultural shifts that have transformed the Midwest, and through the Midwest, the nation—and the world. Many of these men are familiar, icons even—Ford and Reagan, certainly, Ernie Pyle, Sinclair Lewis, James Dean, and Lawrence Welk—and others, like artists Oscar Micheaux and John Steuart Curry, economist Alvin Hansen and composer Meredith Willson, less so. 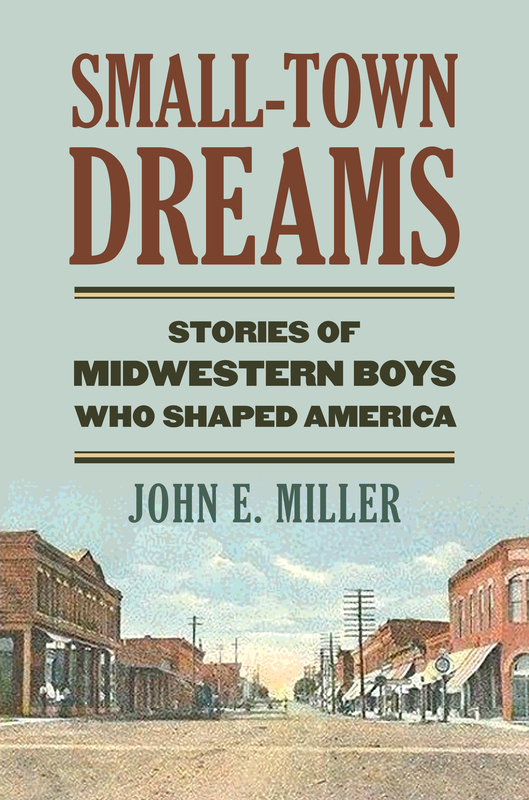 But in their stories, as John E. Miller tells them, all appear in a new light, unique in their backgrounds and accomplishments, united only in the way their lives reveal the persisting, shaping power of place, and particularly the Midwest, on the cultural imagination and national consciousness. In a thoroughly engaging style Miller introduces us to the small-town Midwestern boys who became these all-American characters, privileging us with insights that pierce the public images of politicians and businessmen, thinkers and entertainers alike. From the smell of the farm, the sounds and silences of hamlets and county seats, the schoolyard athletics and classroom instruction and theatrical performance, we follow these men to their moments of inspiration, innovation, and fame, observing the workings of the small-town past in their very different relationships with the larger world. Their stories reveal in an intimate way how profoundly childhood experiences shape personal identity, and how deeply place figures in the mapping of thought, belief, ambition, and life's course. John E. Miller's many books include Governor Philip F. La Follette, the Wisconsin Progressives, and the New Deal; Looking for History on Highway 14, and, also from Kansas, Laura Ingalls Wilder’s Little Town: Where History and Literature Meet.